I've been using up the last of the ten pound box of local blueberries I bought last week. So far we have had blueberry scones , blueberry muffins, a blueberry upside down cake and breakfast this morning was blueberry pancakes. And I have a blueberry pie in the oven as I type. I used my favourite pancake recipe but rather than add the berries to the batter I cooked the blueberries with a bit of sugar and fresh lemon juice for about five minutes. Just long enough to make a sauce but not long enough for the berries to cook down to nothing. Add the lemon juice to the milk, Melt the butter in the microwave. In a blender mix, eggs, milk and butter. Add the flour,salt, sugar, baking soda and baking powder. Mix until blended. Heat griddle and brush lightly with margarine. Pour out batter to desired size and when top side has bubbled flip and cook for about 20 to 30 seconds on flip side. Place in low oven to remain warm while you cook the rest. Oh my! You have my mouth watering! Our Jersey blueberries have been super this year! Cookbook material..for the very best of blueberries! I ate out today for brekkie.I left 1/2. I would have eaten all of this! mmmm look at that stack! blueberry pancakes are my fav! I agree with Mme. M ~ COOKBOOK material, for certain. Have I told you how happy I am that you made the decision to blog? This is an absolutely perfect breakfast! Nothing like great blueberry pancakes! Thank you, I really appreciate you all taking the time to comment. Mary I have you, Monique and Jain to thank for your help and encouragement. I love what your posts. 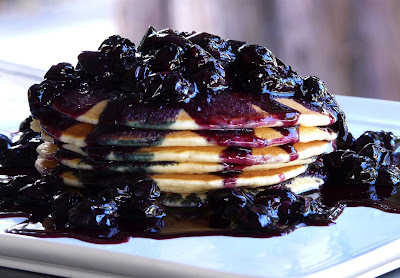 These blueberry pancakes looks ridiculously awesome! Oh my gosh does that look berry sensational!! I made these and they were delicious. It was my first time ever making pancakes without a mix. Mine didn't rise up that much, they stayed pretty thin. What did I do wrong? They were still awesome but I would like to improve upon them next time, so any tips are appreciated. BC, Instead of souring the milk with lemon, use real buttermilk instead. Or use the sour milk but reduce the amount so that you have a thicker batter. Either way will work and you will have a thicker pancake. We actually prefer a thin pancake. In fact, sometimes I thin the batter even more and make very thin, almost crepe type pancakes. i googled blueberry pancake images and yours HANDS DOWN is the BEST looking!!! I'm going to make them! !